Made in Italy. If you know your leather, this is full-thickness, dark brown, heavy leather and is Made in Italy. The photos are of the actual jacket for sale. Levis "Made & Crafted" Tan Goat Leather Unisex Jacket, Made in Italy SZ 3. Shipped with USPS Priority Mail. Original, vintage jacket with an original price tag of $898.00. 100% authentic. Never worn, new without tags, perfect condition with extremely soft goat leather. Unisex sizing and style. Comes from smoke free home. Email me with any other questions or concerns. Color: Black w/Black fleece lining. Material: Polyvinyl/Polyester, Lining: Polyester. • Double front zipper for added warmth. Due to lighting conditions, colors may vary slightly from picture . I try to describe each item the best that I can. MENS LEVIS BIKER BLACK LEATHER Large HOODIE JACKET COAT good CONDITION. Condition is Pre-owned. Shipped with USPS Priority Mail. Levi's Sz Large Mens Classic Motorcycle Genuine Brown Leather Trucker Jacket Condition is Pre-owned. Shipped with USPS Priority Mail. Collectors item for all Supreme and Levis lovers Suede leather outer Polyester lining Great condition Shoulder 19” across Chest 20” from armpit to armpit Sleeve 20” Length 28” Visible soiling on inside bottom on suede and around sleeve cuffs , see photo Levis X Supreme Suede Trucker Jacket Size L. Condition is Pre-owned. Shipped with USPS Priority Mail. Style No. 723340181. 100% Genuine Buffalo Premium Leather. All buttons are Snap Button Closure. Snap Button at sleeve cuffs. Top Shoulder Seam to Shoulder Seam- 19". Armpit to Armpit Seam- 21" x 2= 42". I guess it to be from the 70's. The inner lining is in great shape. It really isn't visible unless you inspect it closely and with a lot of light. The pictures don't really do this jacket justice. Levi Strauss Men’s Signature Leather Jacket Zip up, Size M. . In great pre-owned condition. Carefully check the photos as they play a better role in describing the item. Be sure to check our other listings for more quality items such as clothing, shoes, handbags, hair styling products etc. I'm pleased to respond to your questions. Thank you for your interest in this item and happy shopping. LEVI'S Leather Moto Jacket. Made from Buffalo Leather, with ball and chain pulls, and Thermore lining. Only worn once or twice. 26" Sleeve. Up for sale is this Genuine Leather Levis Jacket. Jacket is numbered 223/540. Jacket is in Great Pre-owned condition. Jacket is like new with no signs of wear or aging. Two exterior pockets with zipper closure and one inside zippered pocket along with another smaller inside pocket. Levi's trucker jacket is made with 100% genuine premium buffalo leather. Size: Medium Retails for $398 Note: I take my eBay rating/feedback seriously and want to ensure you are satisfied with your purchase. Please feel free to ask questions and view pictures thoroughly before purchasing. Thank you. The jacket is super RARE and IMPOSSIBLE to find. It's a dark espresso colorway. Wore once Levi’s Leather Jacket. Leather in excellent condition. Feel and looks brand new. Levi’s Suede Jacket Shirt Black Size L. Condition is New with tags. Shipped with USPS Priority Mail. Levis black leather distressed moto lined jacket XL. Condition is excellent, has a geeen mark on one end of cuff(see photo). 26” length, 20” shoulder to shoulder, 50” chest, 46” waist, 27” sleeve length from shoulder. Shipped with USPS Priority Mail. LENGTH FROM BOTTOM OF COLLAR-26". ALL FASTENERS PRESENT AND OPERATIONAL. Full zip with snap closure over zipper style. Multiple pockets. Pre-owned, good condition. Minor wear of white spots and puncture mark. See all photos. Width (pit to pit) - 24 in. Vintage Brown Leather LEVIS Hooded Jacket Size XL Moto Motorcycle Biker Winter. Condition is Pre-owned. Shipped with USPS Priority Mail. Levi’s Genuine Leather Trucker Jacket. SMALL. Condition is New with tags. Shipped with USPS Priority Mail. Levi's Cafe Racer Style Motorcycle Jacket. Jacket is made from a sturdy smooth leather. Full zipper front with zipper cuffs. Front hand pockets; zipper chest pocket; zipper interior pocket along vertical zipper line. Levi’s men’s leather jacket. Size large and was pre-owned. Jacket is in good pre owned condition. Native/Western print in the inside lining. Vintage Levi’s Genuine Brown Leather Jacket Very good pre-owned condition. Size XL Has some scuffs but no tears or rips. Measurements as follows: Chest measurement at underarm: 50” Side-seam: 16-1/2” Sleeve length from shoulder edge to bottom hem: 26” Mid-back: 28” See all pictures as part of the description. Up for consideration is brown leather collarless size XL Levi’s jacket. This item has four outside pockets and one on the inside. This leather jacket is previously owned known flaws & stains are indicated when found. Levis brown leather jacket. The size is large. Tallon Zipped Bomber Jacket. THICK Genuine Buffalo Leather. Knit Collar, Cuffs and Waist. Solid Black. 15.75”Shoulder Width. 38”Chest (19" armpit to armpit). THESE ARE MY RULES. IF YOU APPLIED A BLACK TOUCH UP TO THIS YOU WOULDN'T EVEN SEE IT. MADE OF ~ 100% LEATHER. FROM THE OUTER SEAM DOWN FROM THE TOP TO BOTTOM IS ~ 28. COLOR IS ~ BLACK. THIS WAY I KNOW THAT YOU ARE HAPPY!! Levi's Brown Fleece Lined Jacket, size XL. It is not. It is made of polyvinyl, fleece lined and has an inside pocket. This is a very cool jacket. The hood has two layers of cloth and the holes are in the inner cloth. • Shoulders: 19”. • Back Length: 25”. • Bust/Chest: 24”. Levi's Men's Sz Medium Canvas Beige / Brown Zip Up Jacket - Fast Ship! LEVI'S X ANDY WARHOL FACTORY X DAMIEN HIRST. This piece is part of the original collection designed by Damien Hirst in collaboration with Levi's and Andy Warhol's Factory and was launched at Chelsea's Gagosian Gallery during New York's Spring 2008 Fashion Week. Sherpa collar. Spade chest pockets & welt side pockets. Official NBA label (Interior). 100% Genuine Buffalo Leather. Length - 26". Chest - 21". Shoulder - 18". Tonal team logo embroidery at chest. levis leather jacket XL Distressed Dark Brown. Shipped with USPS Priority Mail. 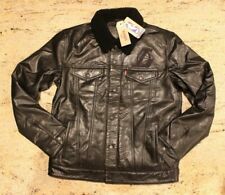 Levi's Black Leather Bomber Jacket S. Condition is Pre-owned. Shipped with USPS Priority Mail. MATERIAL : Shell: 100% Genuine Leather, Lining: 65% Polyester, 35% Cotton, Filler: 100% Polyester. COLOR : Brown (see pics). Length: on the back of the shirt, the bottom of the collar to the hem, laying flat. We are reasonable people. We do, however, reserve the right to make the final decision, in this regard. Sleeve Length: top of the shoulder seam to the end of the cuff, laying flat.